Cholula Hot Sauce Portion Control Packs. Case of 50/7g (0.25 ounce each) packets. Portion pack has a shelf-life of 4 months.The packets of Cholula Salsa are a delicious condiment that can be used on fruits, vegetables, soups, pizzas, tacos, tostadas, sandwiches and on everything you want to give it more flavor. They go well with your favorite snacks. Ingredients: water, chili de arbol & piquin, salt, vinegar, spices and xanthan gum. 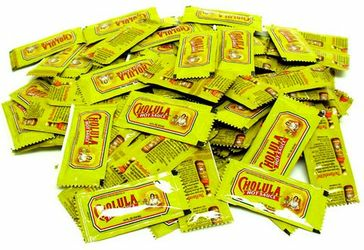 Los paquetitos de salsa cholula son un condimento delicioso que se pueden usar en frutas, verduras, sopas, pizzas, tacos, tostadas, s�ndwiches y todo lo que se te antoje para darle mas sabor. Son un gran acompa�amiento para tus botanas favoritas! Ingredientes: agua, chiles de �rbol y piquin, sal, vinagre, especias y goma xantana. Great for travel and really spices up anything! I found these on line and had to purchase some of them to send to troops in Afghanistan. The first 50 I sent them went over so well I ordered 200 more. The only concern I had after receiving them is the expiration date. The box had the manufacturer and expiration date on it and they were due to expire in November which is only 3 months after I received them. I'm sure the Soldiers will go thru them fast so it doesn't really concern me but if I order more I will ask for fresh product. Cholula has been my favorite breakfast spice for years. No surprises for me there. I want to commend Mexgrocer for their service. The packets arrived very promptly, and were as advertised. ProsGreat spice with as much flavor as heat. I love Cholula, and for years have been taking my bottle with me when I travel. A friend of mine found these packets at a convenience store, so I decided to go online and find them for myself. MexGrocer.com is by far the most reasonable site out there, and now I don't have to worry about my Cholula getting left at a restaurant or breaking in my suitcase! we bought these little packs of hot sauce to send to some deployed troops in Iraq and Afghanistan. They eat MRE's every day and Cholula sparks up the flavor!